CBH Training provide a range of courses aimed at developing individual performance. These are all practical courses targetted at providing key skills for the attendees to assist them in improving their work based performance and developing skills for advancement. The courses are highly interactive and utilise discussion, break-out sessions and role-play to develop understanding. Perhaps the most important commodity today is Time. We never seem to have enough of it and it varies in speed based upon what you are doing and sometimes it just dissapears altogether. The management of our time, understanding how to prioritise demands on us and being able to keep the "Work/Life" balance is a skill that can be learnt. CBH Training offer a course to show you the practical skills to implement the planning of your time and prioritse activities understanding the difference between Urgent and Important. Understanding how to plan a business is essential for any business owner or senior manager. Understanding how to build a Business Plan, create a Budget and Cash Flow or even knowing how the statutory financial reports interlink is essential knowledge. CBH Training offer training in these basic fundamentals which can be taken further if required with individual consultancy on a specific business. The ability to make good presentations is key for any supervisor, manager or company officer. Whether this relates to the preparation of the information you are to present, the media to be used for the presentation or overcoming the fear of making a presentation these courses are for you. Do remember that the fear of making a presentation is only second to the fear of dying but we can help you overcome it and make confident well prepared and well received presentations. The ability to take notes quickly and accurately is very important to many professions whether this be in the emergency services, sales, meetings or anyone needing to keep an accurate record of an event. Speed Writing is a modern form of Shorthand. However unlike Shorthand, Speed Writing provides a technique which can be learnt in a few days and, with practise, builds your speed for very fast note taking. CBH Training have been training this skill for many years and are experts in its application within many branches of business. Training can be via one of our many public courses or as an on-site company specific course. Do you need to take notes at meetings, presentations or lectures? Do you feel you currently write everything you hear, resulting in lengthy and often confusing notes? Would you like to reduce the amount you write whilst retaining all the relevant information? If you have answered Yes to the above questions then have a look at this course. It focuses on improving your listening skills to help you identify the key points from a conversation. It teaches techniques to keep your notes concise and relevant to the subject matter. 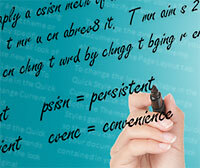 It encompasses Speedwriting skills to noticeably increase your writing speed.